The ABG President, Chief DR. JOHN MOMIS in his opening remarks at today's JSB in Arawa said that the ABG is in extreme budget crisis due to the National Governments failure to make payments to the ABG. He said that the ABG should be receiving SEVENTY MILLION KINA annually under the Restoration Development Grants of which it has accumulated to nearly ONE BILLION KINA. President Momis said this year the National Government budgeted for FIFTEEN MILLION KINA to ABG but until today the ABG has not seen ONE TOEA of those RDG funds. He said he realised that the National Government has its own budget crisis. But the lack of funds being received by the ABG is leading to a desperate situation for us. President MOMIS said we simply do not have the money to do anything. 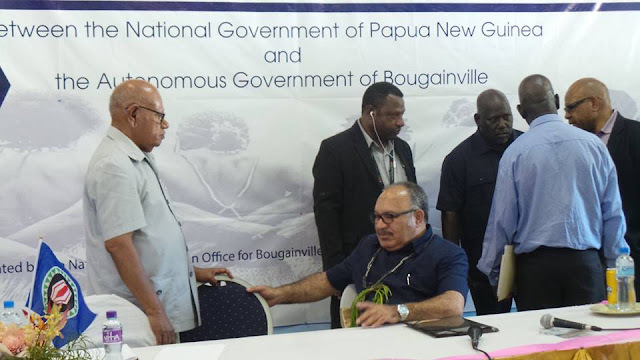 He stressed that Bougainville is not receiving the amount of recurrent grant needed to meet salary costs, and not enough for our Public Service to do much at all.